Fashion week isn't really about the clothes. Perhaps it never was. In this digital age it's about being seen: who's at which show - with the Instagram to prove it - who gets photographed by street style hungry bloggers, who goes backstage, who goes to the party, who has the free Prosecco and popcorn in their hand, who is sitting on the front row (The Frow) of Burberry and Christopher Kane. Whilst the hubbub of celebrity-lined catwalks and flashlit fashionistas make for great theatre, London Fashion Week is at its best when it's a platform for the craft and technical skill of designers. To this end, we've rounded up the under-the-rader and cult collections of those who we think offer exciting sartorial options this year. Of the collections below, it was the artistry of the clothes; how the designers played with with texture, colour and materials that impressed us most. For this was a season of light hearted fashion: fun and playful as old pros and emerging designers alike showed off new tricks with a proverbial wink. A former Fashion East designer, Helen Lawrence is one to watch. With an MA from Central St Martins to her name Helen has already established herself as a master of knitwear. Her A/W15 collection bolstered this reputation with a presentation that included sculptural silhouettes created from lambswool and elastomeric yarn. Lawrence's was an exciting collection which evoked a grunge, 90's aesthetic whilst simultaneously offering clothes that were inherently beautiful. A selection of leather Kult Domini X Helen Lawrence footwear was also on show, again considering form and texture through a series of powerful knots. Instagram went mad for Sophia Webster's presentation at The Welsh Chapel. Models dressed in an eclectic array of futuristic outfits evoked a neon solar system. Stilettos with wings, heels decorated like watermelons and bright coloured mules captivated the imagination and provided a fun alternative to the usual array of footwear (read: trainers). Comfortable and confident in her craft, Sophia Webster shoes will enhance an otherwise utilitarian outfit of the usual basics. 80's punk and designer Pam Hogg is a cult figure in British design. We waited for an hour for the Pam Hogg A/W15 show to begin, but it was worth it just to soak up the electric atmosphere and absorb the outfits of the guests. It was a crowd reminiscent of the East London early noughties hotspot BoomBox, a nightclub which attracted the best of east London's characters; at Pam Hogg drag queens, enormous hair, lycra catsuits and Never Mind the Buzzcocks regular Noel Fielding were just some of the highlights of the pre show spectacle. Also enjoyable was the photographer's pit rammed full of playful journalists who regularly pretended the show was about to start, much to the amusement of the crowd, and more senior members of the front row taking selfies with digital cameras. Of the show itself? Vintage Hogg with fun, daring and eccentric designs that included an avant garde Little Red Riding Hood, pink metallic flares, suede mini skirts with horse shoes on the back and larger than life head dresses. Before London Fashion Week 2015 began officially, London College of Fashion MA womenswear show presented their finest graduates in the beautiful surroundings of The Wallace Collection. Guests perused the Roccoco venue before entering the main courtyard for the show proper. It was a technically impressive collection, in which students considered structure and form alongside ideas of gender. The entire collection was strong, as one would expect from a leading fashion course in the country, yet we particularly enjoyed Scottacus Anthony's designs in which a sense of British military was mixed with clashing textures; layered upon each other to create a sense of energy and urgency that is often lacking from the minimalist aesthetic of so many contemporary designers. Also of note was Meng Yu's frill laden, oversized pastel dresses which were both artistically beautifully and structurally impressive. Eudon Choi created a wearable and grown up collection for A/W15. It was a show of rich metallics, thick silks and fine cuts - stylish without trying and finely crafted; the type of outfits that will easily fit with a Sunday brunch on Westbourne Grove but could also be taken for a spin on a night out in Hoxton. We especially loved the flares which sat just above the ankle, and a gold sleeveless dress which is a must have for the Christmas party season. 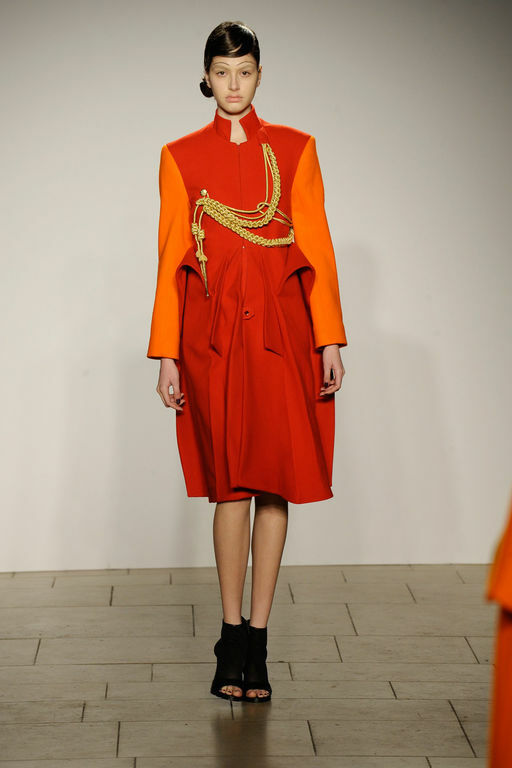 If it's coats you're after this season, Hakaan Yildirim is your designer. Culture Whisper's last show of the week was an aesthetic treat in which over sized duster coats were given a luxury makeover; rich hues of green and red mixed with toned down zebra prints to create coveted garments. Clothes were teamed with turbans and abstract head wear to lend a bohemian edge. We recommend if you are a reader searching for a statement piece to spice up your winter wardrobe.